Famous for a rich tradition and long line of legendary firearms, Remington is one of the most recognized and respected names in the shooting world. Striking the perfect balance between tradition and cutting-edge innovation for more than two centuries, Remington manufactures some of the finest ammunition available to the modern shooter. 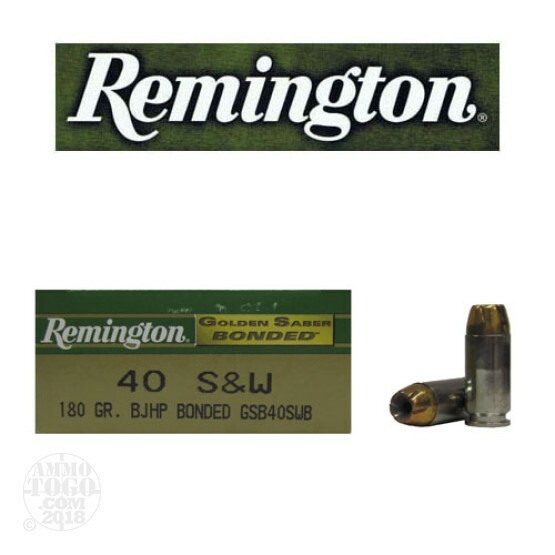 Perfect for the high-volume shooter, this package contains 500 rounds of Remington Golden Saber .40 Smith & Wesson ammunition. Each cartridge is loaded with a 180 grain bonded jacketed hollow point (JHP) projectile. Golden Saber projectiles feature a jacket constructed entirely of cartridge brass. These thick, quality jackets are designed to release energy over longer distances while providing consistent terminal mushrooming. These unique projectiles also feature spiral nose-cuts, the construction of these bullets permit expansion at lower velocities without sacrificing penetration or energy transfer. This factory fresh ammunition is non corrosive and boxer primed. The primer and mouth of each cartridge features special waterproofing for extra reliability, even in wet weather conditions. Cases are high-quality, reloadable, nickel-plated brass for high visibility and smooth feeding and function. Each round produces a consistent muzzle velocity of 1015 feet per second with 412 foot pounds of muzzle energy.